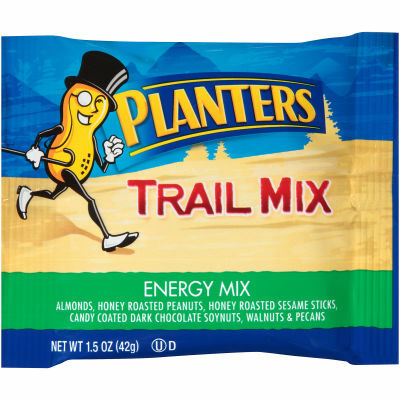 Planters Energy Mix Trail Mix is an earthy, crunchy, sweet and salty combination of your favorite nuts. Included in the mix are almonds, honey roasted peanuts, honey roasted sesame sticks, candy coated dark chocolate soynuts, walnuts and pecans to give you a delicious boost of energy in every handful. Whether you want to kick-start your day or need an afternoon energy fix, reach for this mix and feel the benefits of a wholesome source of energy. Cholesterol-free and kosher, Planters Energy Mix Trail Mix snack bags are a quick treat you can feel good about.